Reno 1868 FC is a professional soccer team in the United Soccer League, a Division II league under Major League Soccer (MLS) in North America. Games are played at Greater Nevada Field, home to the Reno Aces baseball team. Reno 1868 FC is affiliated with the San Jose Earthquakes of MLS. As you may know, the word "football" refers to soccer just about everywhere else in the world except the United States. 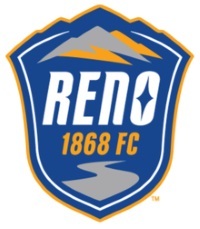 The name for Reno's pro soccer team uses the year Reno became a city and FC for "football club." Online tickets for home games are available online. Here you will find choices including single game tickets, group tickets, memberships and information about game day experiences for fans. For ticket information, call (775) 334-7001. For other information about the team, memberships, special deals and promotions, go to the official Reno 1868 FC website.